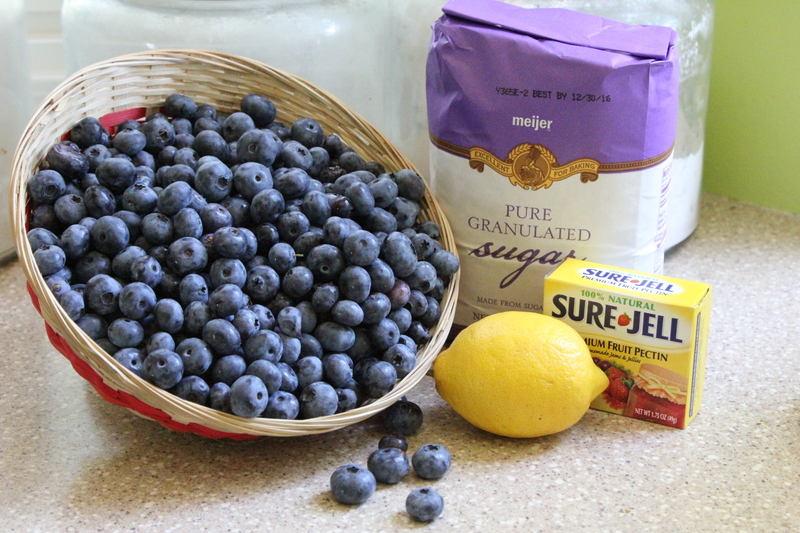 Blueberry Jam – blueberry picking time is coming up! This week, my girls and I picked strawberries at a local farm. It’s the little orchard just up the road from us and we managed to pick 15 lbs. I would have stayed longer and picked more, but my helpers were tired and I could only keep bribing them for so long. It was the last day to pick strawberries at that farm so I lucked out. I had been busy earlier in the month and put it off and almost missed out so I’m so glad we got our fill just in the nick of time so I could make my yearly supply of strawberry jam. I’ve shared my Strawberry Jam post before, but here it is in case you can still pick a few red gems in your region. 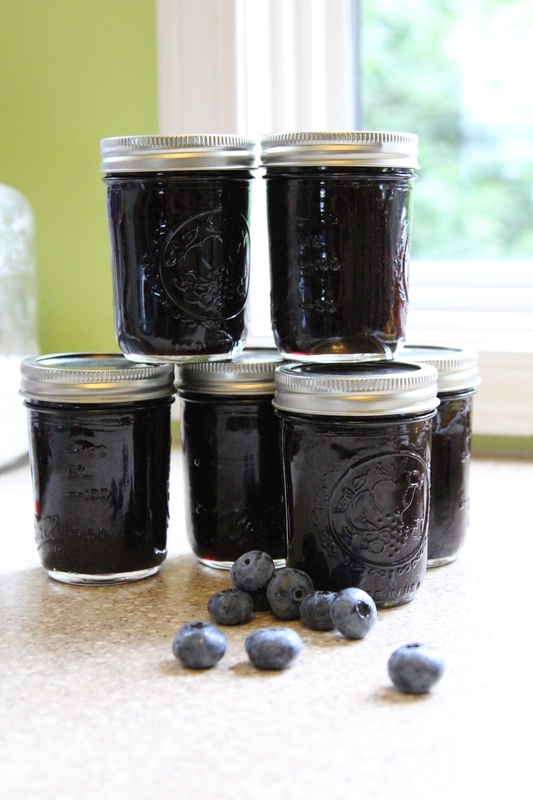 Blueberry season is about to begin so if you love them like I do, make a batch of jam to enjoy all year round! I always pick a lot so I can just throw them in freezer bags and they are perfect for smoothies, baked baked blueberry french toast, and pancakes topped with blueberry sauce any time we want them. I’m always a little sad when I go through my final bag and have a little blueberry drought until it’s time to pick more. 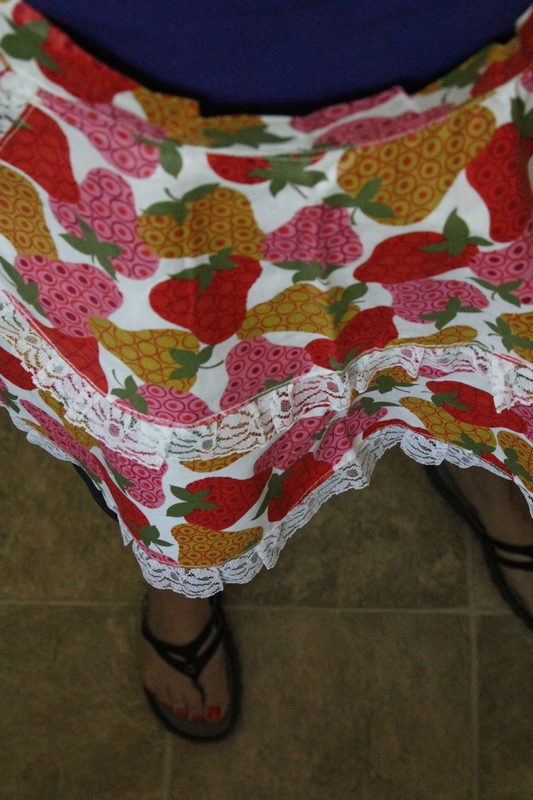 By the way, isn’t this the cutest little jam making apron? I have a basic canning utensil set. It’s less than $10, but you can get by without it, or just buy the things you really need. The most important thing is the jar lifter so you can safely lower and raise jars in an out of the pot without burning yourself, or breaking the jar. The other important piece of equipment is a wide funnel. This makes filling the jars a lot less messy. Jars. 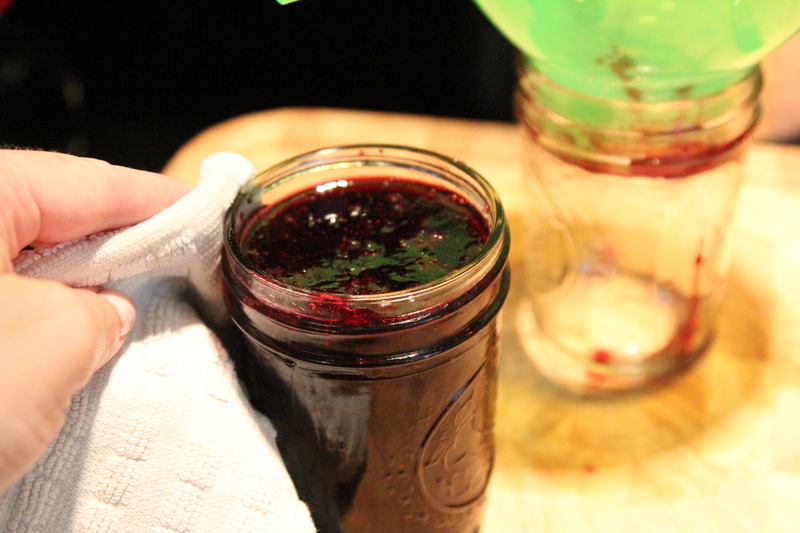 If you don’t fly through the jam like a bunch of Grizzly bears, you probably want to stick with the 8 oz size jar. In our house, we can get by with the larger 12 oz size jar for our favorite jam (strawberry) because I know we will use it up in plenty of time. I use the smaller 8 oz jars for blueberry just because we don’t use it quite as much as the strawberry. Just depends on our mood. I tell you, though there’s something special about a blueberry bagel, toasted up and then topped with a little cream cheese and then a little homemade blueberry jam to bring it all together. Bring on the blueberry! 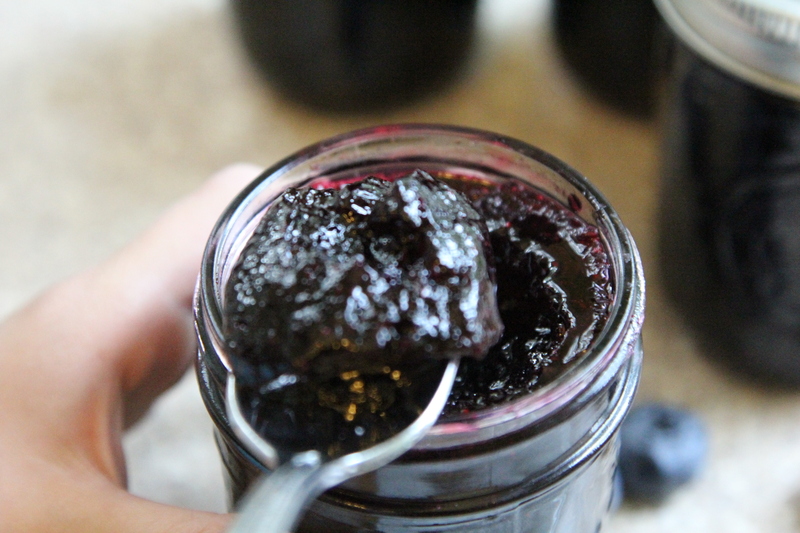 You can also spoon out a little jam into a bowl, heat it up and drizzle it over ice cream for a yummy treat! You’ll need a lot of sugar. Plain white sugar, you know the bad for you stuff! I’m sure there are ways to make jam with sugar substitutes, but that’s just not how I roll. You’ll need some fruit pectin such as Sure-Jell. That’s the brand I use because that’s what my mom has always used. You’ll need a large pot. I wish I had a bigger one like a big old shrimp boil kind of pot, but my 8 quart one and other smaller stock pots get me by. You’ll need one lemon per batch. 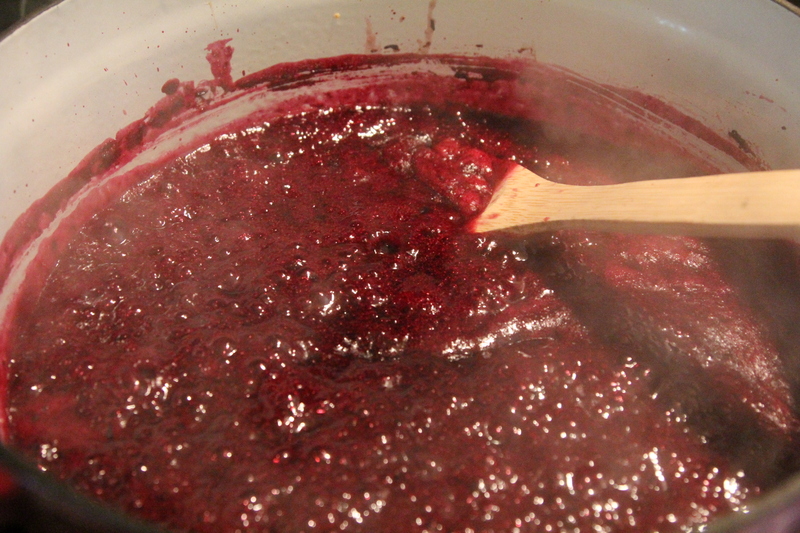 Most jams have some sort of acid included in the recipe. It’s not really for flavor, but to help the jam set properly. 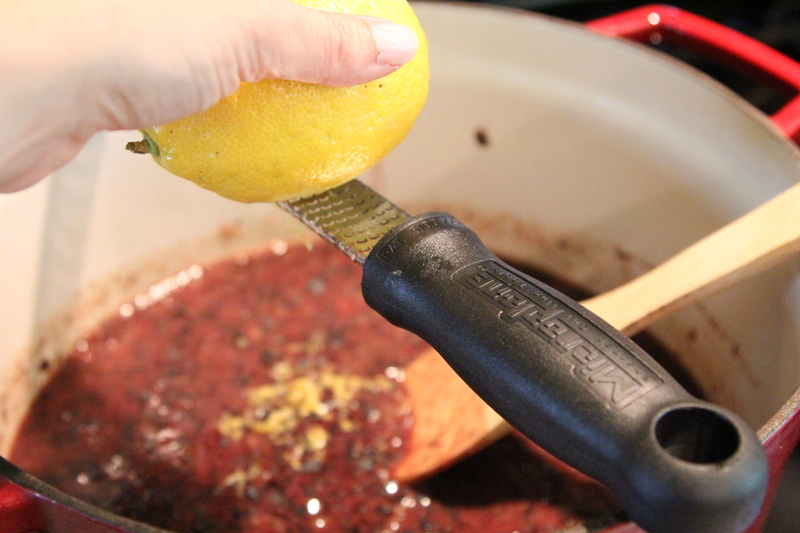 The acid from the lemon helps the pH and helps the pectin to be released and gel together. It also helps to prevent bacteria. 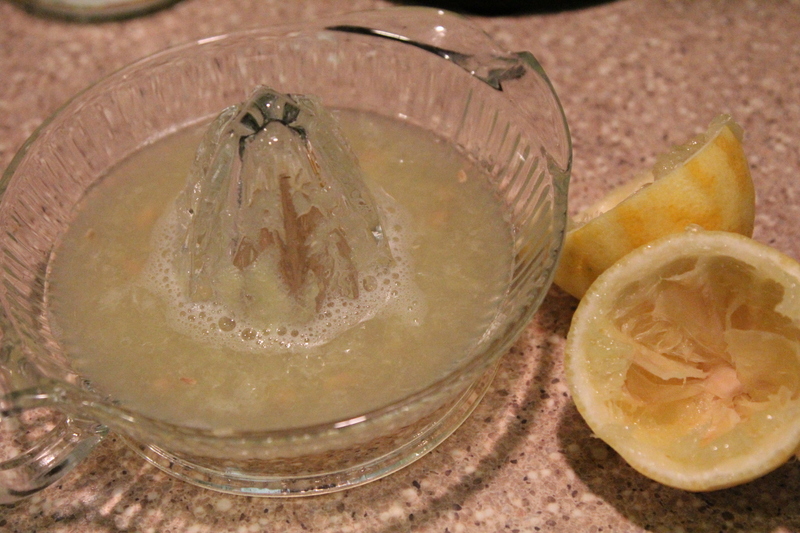 I love to add the zest of the lemon along with the juice, so I do get a little more lemon flavor. The zest is totally optional. You will want to prep everything so you are ready to go when the jam is cooked and bubbling to perfection. Rinse and remove any stems and bad berries. Mash the berries. You can do this by hand with a potato masher, pastry cutter, little fingers that will be stained forever, or you can whip out your food processor and make it a lot easier! 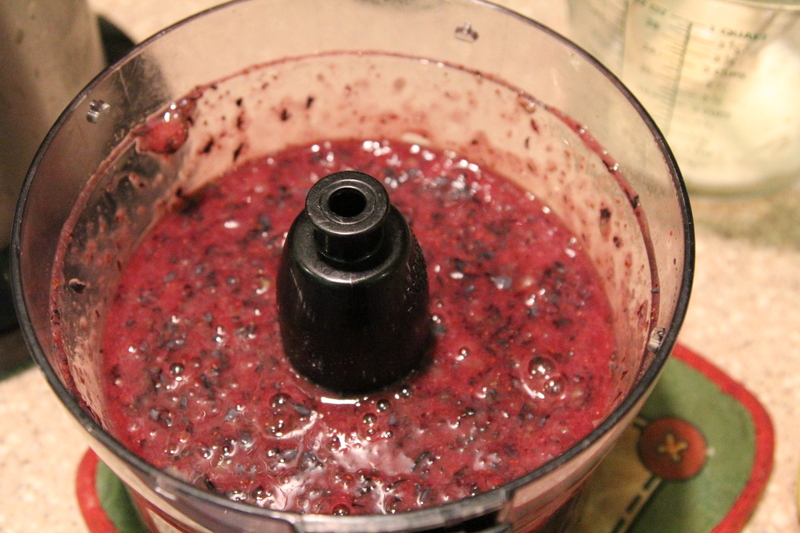 Zap those berries in the processor and puree until they are as mashed as you like. I like a few little chunks in my jam, but not too many. This is totally your preference. You will need 5 c of mashed berries per recipe. Add 5 C of mashed berries to a large, heavy pot. No heat yet, just wait. Wash all jars and lids. 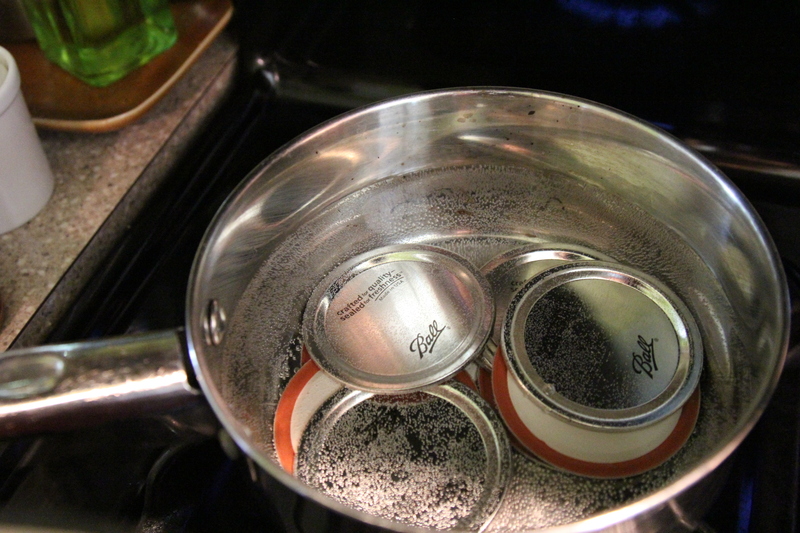 Don’t bother drying since you will submerge the jars in a warm pot of water on the stove. It’s important to keep them very warm so that they don’t crack or break when you pour in the hot jam. Keep this pot with the water in it, even as you remove the jars from it and fill them with jam. That way you don’t have to start all over with heating up water in the pot for the sealing process. The lids can be simmering in warm water too. You will want to take them out of the water and dry them just before filling jars. Now back to your berries. They are all ready and waiting in the large pot. Go ahead and zest the lemon if using zest. Add the juice from the lemon and stir. I use a little strainer to catch those pesky seeds. 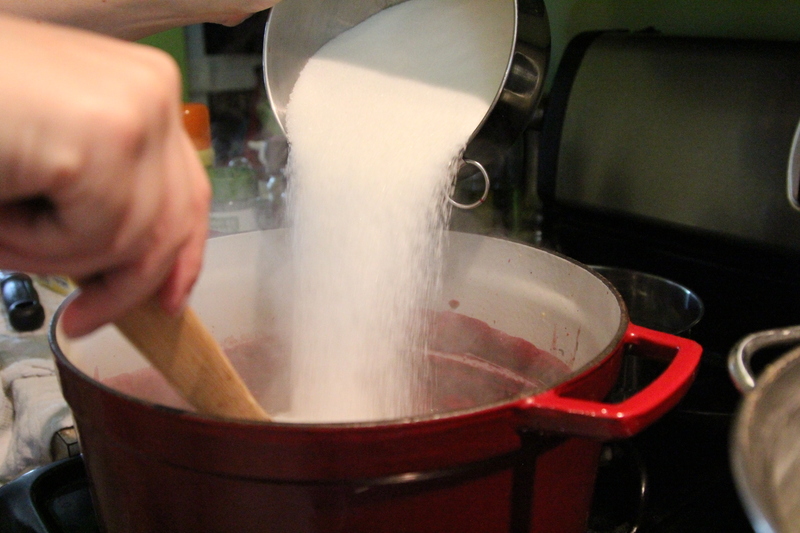 Add in one packet of Sure-Jell (1.75 oz) and stir until all dissolved. Now, it’s time to turn on the heat! Bring this to a vigorous boil. Once it reaches vigorous boil, add in all the 5 C of Sugar. Yes it’s a lot, but it’s for the entire batch and lowering sugar may affect the gelling of the jam. 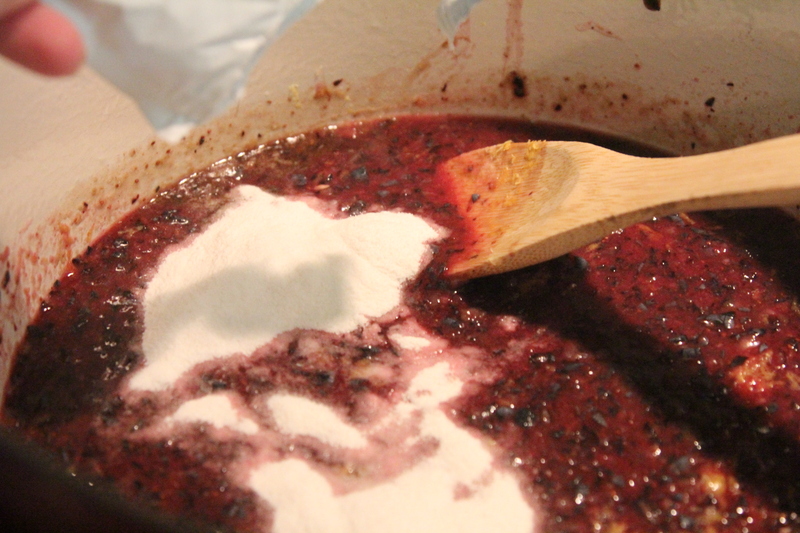 Stir the sugar in the jam until it’s all mixed and return this to a rolling boil. Once it reaches a rolling boil, boil for 1-2 minutes, stirring a little and then turn off the heat. If there is any foam, you can spoon it off the top and discard. Remove 2 jars from your warm pot and get ready to fill them. I like to have two out at a time so that I have a jar to put the messy funnel into, rather than setting it on the counter. Fill the jar with the jam leaving 1/4 inch of space at the top of the jar. 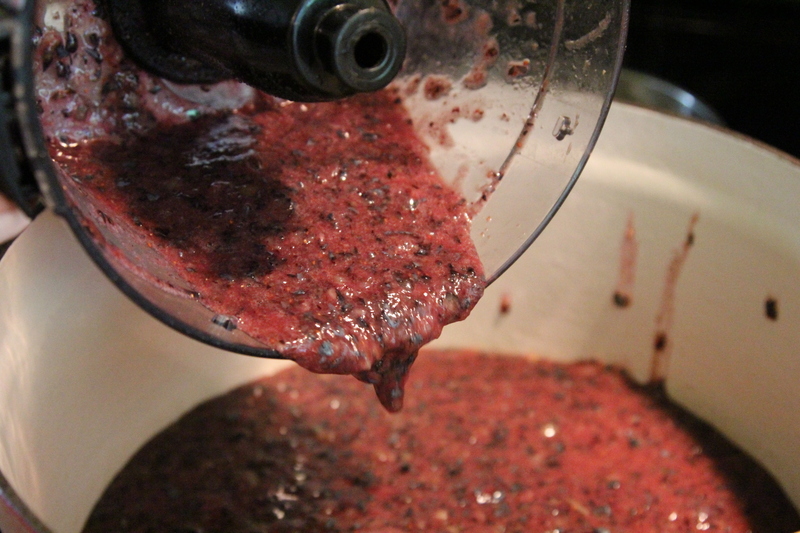 Try to get equal amounts of liquid and fruit chunks into each jar so your batch is consistent. Place the funnel on the next jar so it’s ready for you. Wipe of the top edge of the jar with a clean towel to make sure there’s no moisture. 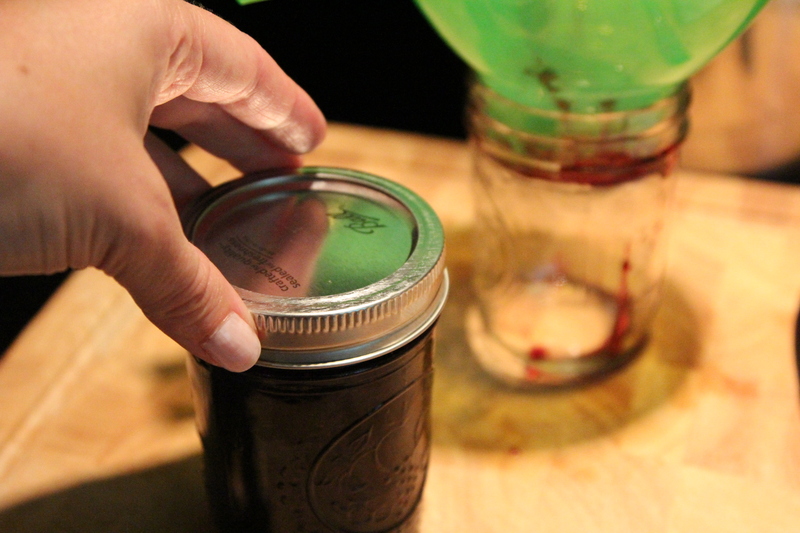 Carefully place the dried center lid on the filled jar and then screw on the outside ring just until tight. 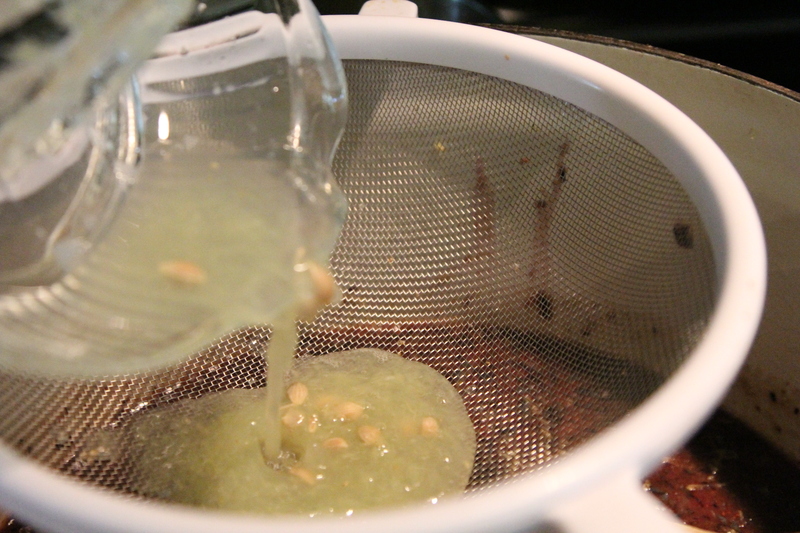 Repeat this process until all your jam is used up. If your last jar can’t be filled all the way to the top leaving only 1/4 of an inch of space because you run out jam, then just mark that jar and remember that it needs to go right in the fridge after the sealing process. That one may not seal properly so it should be refrigerated and used up with a month or so. Once all your jars are filled, gently lower them back into the pot of warm water. You may need some empty jars as place holder to help keep all the jars upright during the sealing process. Just fill the empties with some water so they don’t tip over. A canning rack fixes this issue, but I don’t own one. 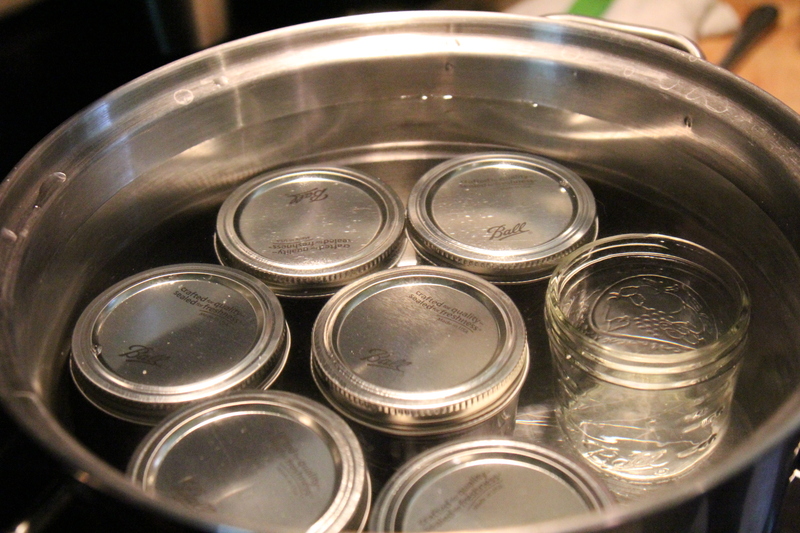 Make sure there is enough water in the pot to submerge the jars, or at lest go up to the lids. Bring this all to a rapid boil. Let sit in the pot for 5 minutes. 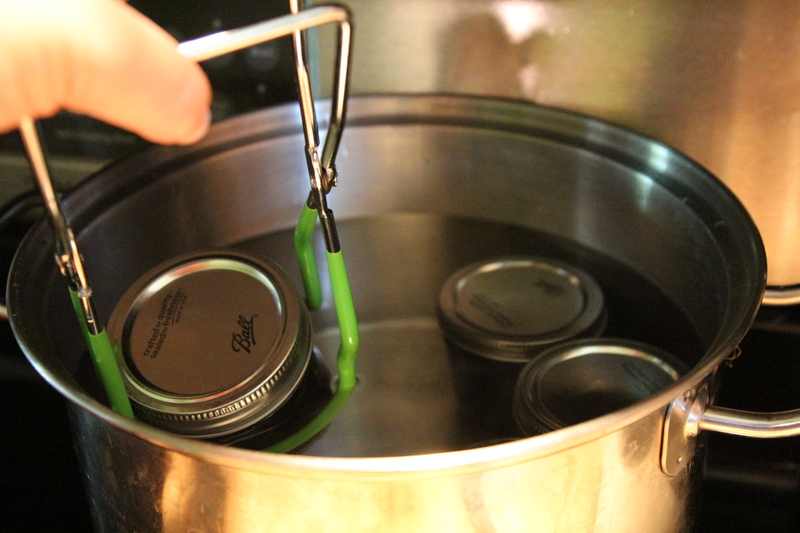 Carefully remove jars from pot and set in a safe place where they will not be disturbed. (I mean by eager jam eaters who can’t wait to try your delicious jam). Leave the jars alone for 24 hours and by then they should all be sealed. Check the seal. The center should be down. Gently wipe off lids if you have any water spots. Make sure outer rim is tight. Jam can be stored on the shelf for up to 1 year. Once opened, jam must go in the fridge and used with a 4-6 weeks. The fridge life will vary depending on sugar, sweetness of batch, acidity of lemon juice used so if it smells funny or you see fuzzy stuff forming – don’t eat it! This is where small jars are beneficial in less waste of that precious jam. We don’t seem to have that issue in our house since jam sandwiches are my youngest daughter’s favorite and she eats one just about every day for lunch. Kind of reminds me of the bears from the darling movie Paddington. One 1.75 oz package of Sure – Jell powdered fruit pectin. Have all jars and canning supplies clean and ready. 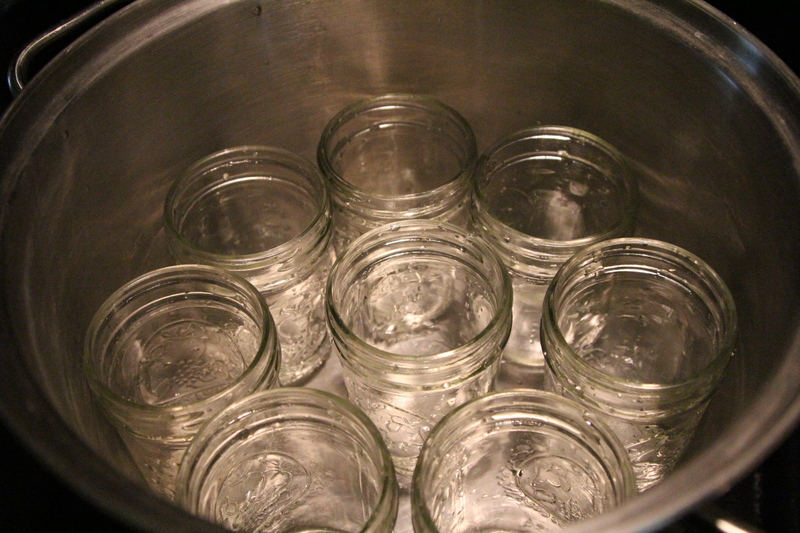 Keep jars in a large pot of very warm simmering water. Rinse berries and remove any stems, leaves etc. Mash Berries by hand or use food processor. Spoon 5 C mashed berries into large, heavy pot. Add in Sure-Jell and stir until dissolved. Bring this to a vigorous boil. Add in 5 C sugar all at once. Stir and return to a rolling boil and boil for 1-2 minutes. 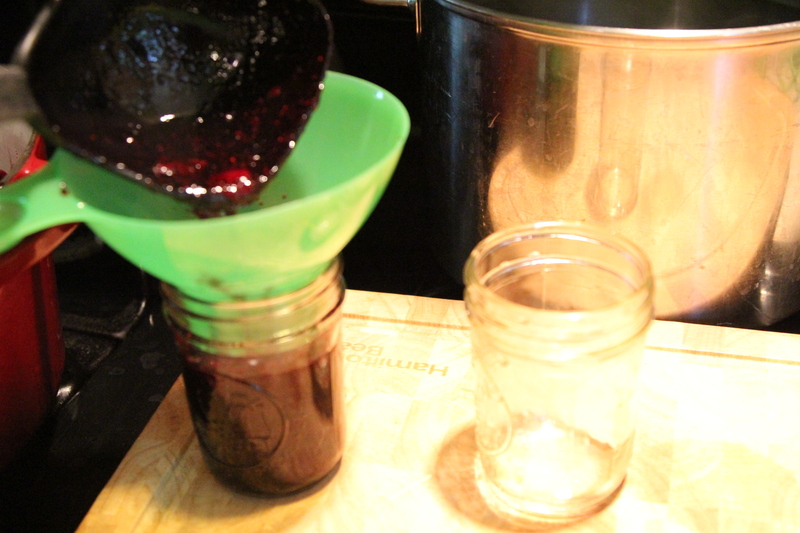 Carefully remove 2 jars from warm water and fill with jam using funnel. Leave 1/4 space at the top of each jar. Wipe off rim of jar with clean dry towel and place dry center disk and outer ring. Screw on outer ring just until tight. Return jars to pot with warm water and add more water if needed until all jars are barely covered with water. Use empty jars as placeholders to prevent jars tipping if needed. Bring this to a rapid boil. Boil for 10 minutes. They may begin to seal. You will hear them pop. Leave jars in the pot for another 5 minutes. Carefully remove the jars from the pot and place in a safe place where they will not be disturbed for 24 hours. They will continue to seal and pop. Leave them alone. After 24 hours, check the seals. All the jars should be sealed. Check center disks. They should be down. Make sure outer rings are tight and secure. If for some reason, one isn’t sealed (maybe it wasn’t filled quite enough, or rim was moist when center disk was placed), then the jar must go in the fridge and be gobbled up within a month. All sealed jars are good on the shelf for a year. 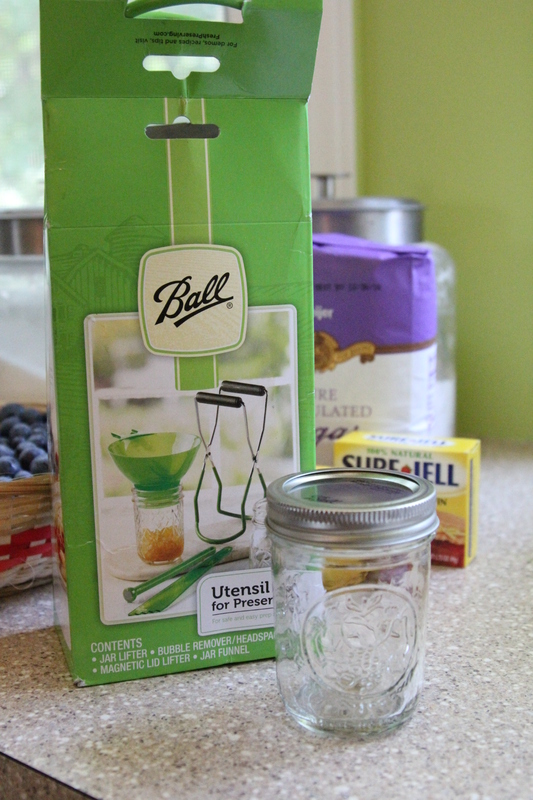 Once opened, jars must be refrigerated and used within 4-6 weeks. Christy, what’s the difference between processer or a bullet/blender?? Why do u use the processer? Hi Michelle! I would just use whatever you have that will purée the berries evenly and quickly. My food processor seems to work better than my blender for stuff like this, but I don’t own a bullet or ninja blender. If I did- I would definitely give those a try and just see which device works best with the least amount of mess.